Clark is sitting on the porch of his old family home flicking through photo albums of Martha and Jonathan Kent's past. So young and so deeply in love. Clark thinks back to the early times in his relationship with Diana how their loneliness and similarities brought them together as two people. Then how their similarities as heroes brought them together as Justice League members, colleagues and ultimately lovers. It is a double date, early into the relationship for Clark and Diana, with Arthur and Mera in the heart of Atlantis. While Superman and Aquaman sit back after a hearty meal and talk gadgets and technology, Mera takes Diana away for a swim and asks Diana when she and Clark will officially be a couple and tell the other League members. Mera asks Diana what it is that attracts her to Superman besides his impressive physique. Diana points out that Clark is genuinely caring and kind. They both feel so deeply for each other but their careers as heroes makes love a complicated addition to their lives. Mera points out they aren't so different, He is a King and a superhero and she a Queen of an ocean jail, the League offers even more complications to their time together but their love keeps them strong. Sometimes a kiss can be far scarier than saving the universe. In Pakistan two civilian ramblers are attacked by Dichara, a demigod with a literal split personality. He has decided to launch an attack on Earth to Olympus that with paint him as a hero and a villain. Diana and Clark arrive and save the civilians and battle Dichara and until Diana is able to gain the upper hand. She tells Clark to head home while she returns to Olympus to rejoin him later. Clark ponders the decision he discussed at his parents grave and opens the small box he took from the Kent farm, revealing it to me Martha's wedding ring. When Diana returns however she reveals that Ares was recently killed and she had kept a recent development from Clark... she was now the God of War. Clark reacts badly, not only to Diana's new role but the lies and deceptions his girlfriend crafted to keep it from him. When Clark presses for answers and Diana offers answers that conflict with his beliefs, cracks begin to appear in their relationship. How can Peace love and Justice be Wonder Woman's cause when she is now the epitome of war? The questions create a tension and Diana apologizes for hiding her role while Clark struggles with how this will affect their future together. Clark burns his hand while making a classic Kent recipe. It is a short while now since Clark developed the Solar Flare and Diana doesn't like its after effects of leaving her partner powerless. Clark points out that the downtime he experiences as a human after the Flare are what he considers an upside. The quiet night in is interrupted by a request for the God of War to aid in a quest. When Clark offers to help, Diana shuts him down and tells, while powerless he is best used to stay at home and to keep dinner warm while she goes out to work. Clark struggles with the trappings of a powerless life while Diana fights the good fight. When she returns home Clark is alone in the dark and dinner is ice cold. Clark takes out his frustrations on Diana for leaving him behind. He can still contribute to the relationship, he is still a hero, he is more than his powers. The two of them realize then that they have to work together, to make their relationship, their bond, their life, continue to work. Clark thinks back over the times past, their adventures as heroes, their struggles as a couple from beginning to the end. The time to propose is gone, for better or worse, Clark and Diana are no more, at least romantically. He closes the Kent family album, walks back into his parents bedroom and replaces his mother's wedding ring in her old dresser before leaving. Story - 5: I have always, always been a fan of Lois and Clark as a couple. I was, like many, dismissive of Diana Prince and Clark Kent as a couple, not Superman and Wonder Woman, but Diana and Clark. None of the stories I'd read changed my mind - until now. For the first time we got a series of stories at different time periods of the New 52 that explored the relationship the couple share and how it affected the main stories and led to their end. Beginnings and Ends is heart wrenching as the opener and closer. Taking a Breath was a bit too soppy for my liking but went quite a way into exploring the attraction between them and how it transcends physicality. Unsaid was a strange mix. Dichara as a device was something that didn't work, and was ultimately unnecessary. The fallout afterwards was pure palpable drama and offered a strong exploration is a rarely seen side to their relationship. Clark's frustration, anger and disappointment is something shared with readers over the decision to make Diana an ambassador of peace AND a force or destruction but again the writing solidly explains direction, motivation and resolution. Vulnerable was a beautifully written segment exploring not only the misstep of the Solar Flare but ties it into a character moment, development and a dramatically strong piece that makes use of the long lost and often forgotten roots of the Kent family. By the end of all the segments they seemed to truly be a couple, ups and downs, just like the rest of us mere mortals and instantly making them relatable to me as the reader. The finale made sense as it approached but by its end I found myself a fan of Diana and Clark - consider this annual a success in action and drama. Art - 4: Each segment had some great accompanying artwork, the parallels between key photos of the Kents and the echoes of Prince and Kent are noticeable and with each facet of the relationship explored so too did the artwork adapt to match. Vulnerable was of particular note, their dark moods were reflected brilliantly in the pencils and inks. 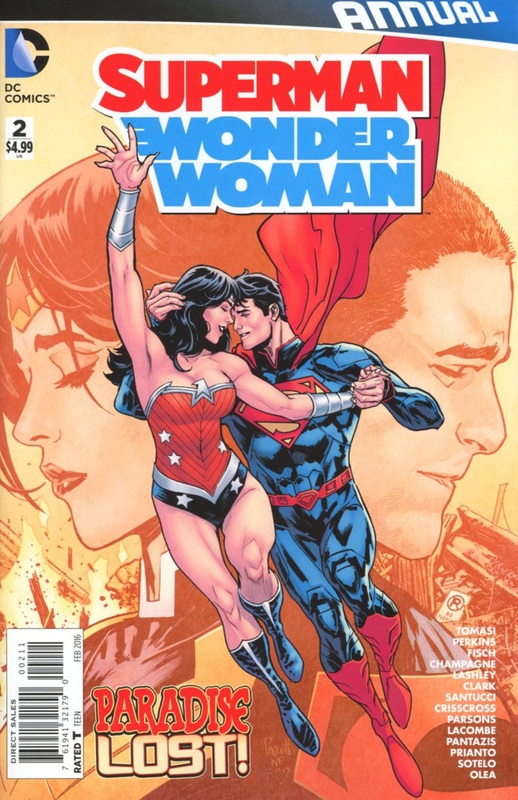 Cover Art - 5: As with the recent cover to Superman/Wonder Woman #24 this cover draws you in with both a wow factor, the 'warm and fuzzies' of a rare happy moment in their early days focused on in the foreground and their current dark emotional state in the background. Again this team of writers and artists really have me buying into Diana and Clark as a couple. Bravo DC!